← Does Your Brewery Need a Little Buzz? We only remember 20% of the information we hear. But if you add an image, video, or joke to information, we can retain up to 65% of that same information. That’s because visuals and humor light up more parts of our brain. You can insist that the subject matter alone is captivating and that your audience might roll their eyes more than laugh. You only protest too much because you’re scared you’re not funny. And you’re right. You probably aren’t funny. If you don’t think you’re funny, no one else will. People who think they’re funny are willing to have jokes that don’t land; they keep lobbing tennis balls. People who do not think they’re funny tend not to try. But what’s interesting about not trying is that they’ll get laughs from random things they say where they didn’t intend to be funny but were! We all remember when teachers leaked out unintentional lines of humor that broke up the monotony of class. Whether it was a yoga class where the teacher dropped their misty Buddha voice and yelled at someone on their phone or if it’s a macroeconomics class and they mentioned Beyonce. We remember these leaks of humor because they were incongruous with the class protocol and they held our attention precisely because of the surprise. So, when I say humor will enhance your online lecture, or webinar, I don’t mean you make an effort to write a joke per paragraph or to force it. What I mean is that a few tablespoons of humor in the right places at the right times will make your webinar more memorable. Indeed, setting up the webinar as a no-nonsense and then adding a little bit of nonsense will be the incongruity that leads to laughs. Humor itself relies on a setup and then a punchline. Sometimes, the setup is establishing the “typical” tone and expectation of a webinar, and then the punchline is when the tone departs from expectation. It’s called a “benign violation” when a joke violates our social or moral code just enough to make us laugh but not enough for us to feel defensive. Dancing that line between comedy and tragedy and humor and cruelty is key. Over the line and you’ve gone from a benign violation to a malign violation. Benign violations sounds like a paradox but they’re actually what makes a learning atmosphere feel positive and free. We feel like we can raise our hand and ask a question in that atmosphere. We find ourselves focusing better because we cannot anticipate where the lecture will go next. As you can imagine, having our brain in this mix of relaxation AND engagement helps us retain information. If our brain was in that auto-pilot mode where we only listen enough to catch the gist, but we’re thinking ahead about what we’ll eat, who we’ll see, then we’re OUT, we’re tense, and we’re waning. Humor engages us to actively listen because we expect to be surprised or delighted again and we don’t want to miss a beat, because behind every fact there may be a surprise-flavored jolly rancher. Indeed, that reward-centered part of our brain is salivating in anticipation, but not living for the moment the webinar ends. Humor keeps us present and improves our mindfulness. Hearing humor in an educational lecture like a webinar also encourages divergent thinking. Divergent means “developing in different directions” and divergent thinking means thinking in nuance and possibility rather than in an either/or dichotomy. Thinking in an either/or manner is called convergent thinking and can mean thinking that there are limited choices. For example: thinking, “I’m either a success or a failure. My ex is on a pedestal or beneath me.” In truth, there are more choices than that. You’re not reduced to either a success or failure and your ex has good and bad points. The tendency to idealize or demonize is an either-or type of limited thinking. Satire and humor pokes fun at our egos and certainty and thus it makes us see possibilities beyond the either/or choice. This enables us to be critical thinkers and more empathetic, well-rounded people. Divergent thinking centers on complexity, flexibility, imagination, and risk taking—much like humor. Don’t Villainize Convergent Thinking Though! However, I didn’t mean to be convergent in my thinking when describing divergent vs. convergent. I feel as though I reduced these modes of thinking to an either/or villain/hero dichotomy that wasn’t fair to convergent thinking. There IS a place for convergent thinking and that is MATH! Math needs to have one solution. If we look for several possibilities when solving math problems, we’ll be led astray. Convergent thinking comes more naturally to most of us whereas divergent thinking tends to be developed from reading, creative expression, and music practice. 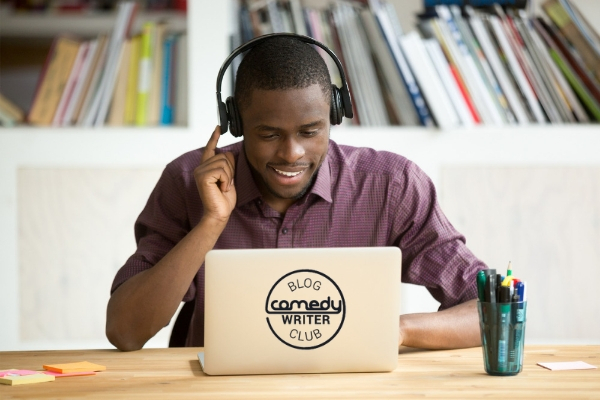 When writing a webinar, don’t neglect the impact of humor to break up information. Appropriate humor that delights more than offends can make subject matter more resonant and memorable. It can create a combination of relaxation and focus in the brain that makes a student feel excited, curious and free. It can catch a student’s attention in such a way that they can retain what they learned days after. A line of humor can make abstractions concrete. And if humor brings an immediate visual to mind, it tends to stick. Finally, in addition to lighting up more parts of the brain, being exposed to humor can develop critical thinking, creative imagination, and divergent thinking in the brain over time.